My own method of tying a lead core helicopter rig is about as safe as you can get. I am confident that the hook link can detach from the lead core every time, should I lose a fish. Before I go into detail about this, and other ‘safe’ rigs, try this simple test to see how safe your rig is. 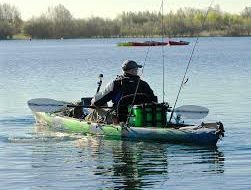 First, take your standard rig, the one that you have on your rods at the moment. Dip it in the water first and then hold it up by the bend of the hook (carefully, or using forceps). Hold it out in front of you and then drop your hand sharply about a foot and stop suddenly. Don’t snap your hand back up again in a flick, just stop abruptly. 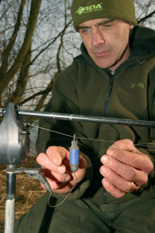 If the lead does not detach in one way or another then your rig is, quite simply, a hazard to fish safety and has the possibility to permanently damage a carp! Think about that for a minute. 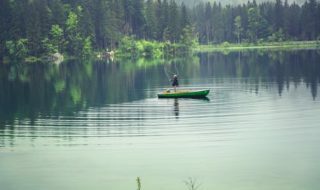 Consider how a fish will free the lead that you have just failed to dislodge. 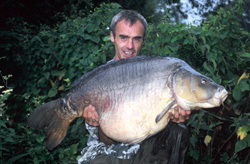 It is no good if you have to hold the lead in one hand and the rig in the other and physically pull them apart – a fish just cannot do this! Don’t blindly trust the products that you can buy on the market to do their job either, just because they say ‘safe’ on the packet. Everything is only relevant to the specific situation it is being used in. Try them out first and make sure that they perform properly before committing a carp to a life with no lips, or even worse, no life at all. It’s also my opinion that most commercially available lead release clips need trimming back, or adapting to the exact situation being fished, before they will actually release a lead. The components that I use include a length of ESP 45lb lead core, a piece of 1.6mm shrink tube and two rubber beads. The choice of beads is the crucial factor that will ensure the safety of the rig. I use the small, soft, green beads from ESP – one 5mm and one 8mm version. They have a supple feel to them and they pass easily over any knots or loops that attach the lead core to the mainline. Lastly a Korda tail rubber and a size 9 uni link swivel are also required. 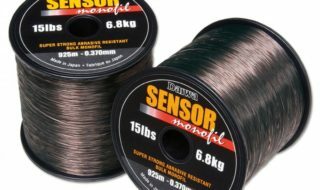 To start with you’ll need a length of 45lb ESP lead core. Dave can only recommend the components he uses. Now get a piece of 1.6mm ESP shrink tubing. It must be 1.6mm. Use half the length of tubing provided in the packet. Slide the length of tubing down the lead core. Dave likes to prepare his rigs at home in advance. Using boiling water, shrink the tubing onto the lead core. This is the only way of shrinking the tube properly. Now get a Korda Konnector rubber and trim the thin end this much. This will help the aerodynamics of the rig. Thread the doctored rubber onto the core, then tie on a lead. The size of lead you use depends on how far you want to cast! Join the shrink rubber to the lead. Slip the shrink tube into the Konnector rubber. Notice how neat the rig is so far! Now it’s time to thread on the beads and flexi-swivel. Firstly, thread on the smaller 5mm bead, large hole first. Next thread on the flexi-swivel (with the core passing through the large ring) and then the 8mm bead, large hole first. This is how the hook link swivel should look, sandwiched between the two beads on the lead core leader. Pass the smaller bead over the shrink tubing, followed by the swivel. The larger bead should just rest on the tubing. If you lose a carp, the hook link should easily come off the shrink tubing and move up the lead core, passing over the leader knot.